Monday, November 21st is a day forever etched in my mind. It is the date my mom was promoted to her heavenly home. I traveled to Iowa on November 13th to be there the following day to celebrate her birthday with her in the hospital. Mom had been sick for one year without definite answers for the complicated health issues she had been experiencing and without a root cause there was no real strategy. That is until it was towards the end of her physical body saying, “that’s it, I’m tired”. On her birthday Mom was coherent but her body was exhausted and there was no real depth to conversation only short statements back and forth and a constant request for water to drink. The day following her birthday her team of doctors asked to meet with me before I flew back home to Orlando. After much assessment, research and aggressive treatment it was determined that although we now had answers to our questions, there was no hope for rehabilitation and with that we were given just days to spend time with our mom before she would transition to heaven. 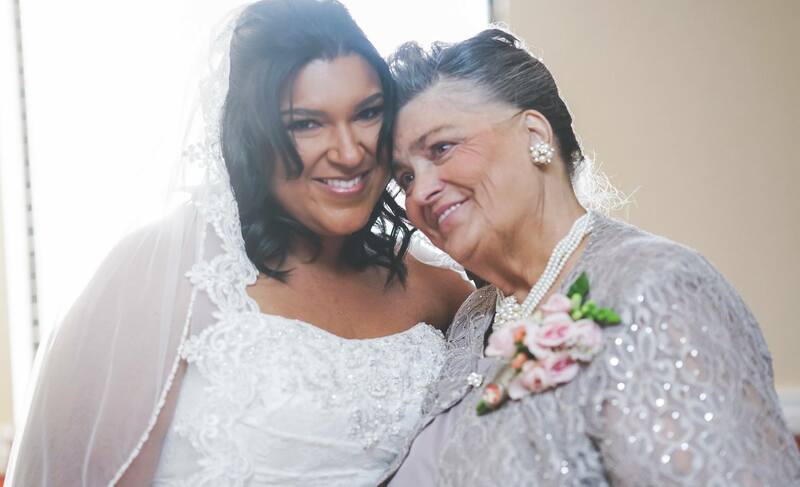 When those words were spoken, my mom instantly sat up in her bed, looked me in the eyes and said, “I’m going to die… at least I got to go to your wedding.” The only thing I could do was bury my head in her pillow and sob. With a team of medical professionals standing around I cared nothing about what I must have looked like weeping in my mom’s pillow. I was just told I would have to let go of the most important person in my life. My mom never shed a tear, instead she looked at me and said, “Call your brother and let him know. It’s time to call the family in.” She then began spewing out plans faster than I could write, her wishes for her funeral, the pallbearers, the colors were to be purple and pink because she said us kids made her feel like royalty. She wanted our pastor to sing In Christ Alone and for my uncle Walt to sing also. I can’t explain what happened other than a surge of supernatural strength and grace as I asked what she wanted to wear and any other details not to be missed. That evening my pastors met me at the hospital and when PJ, my little brother, arrived we told him together that mom was preparing for heaven and we only had days. There were tears but in that moment we all lifted our hands and began to worship. We turned the music up louder and sang without shame of the goodness of our God. His presence filled the room and strangely enough all was well. We began to pray together and my pastor shared scripture. It was a moment in time when heaven met earth in a tangible way right there at the University of Iowa Hospitals. In the days to come I felt as though I was being carried, like grace had swept me off my feet and guided me through every moment of each day. While she was still in ICU I would pull my chair as close to my mom at night as I could get and sleep next to her. Many times I would awake in the night due to routine visits from the nursing staff and it would not be uncommon for my mom to ask EVERY nurse on duty if they knew Jesus. One night when she asked the nurse she replied, “Yes.” Mom said to her, “Good, just know that He has a great plan for your life. Would you mind if I pray for you?” The nurse said she could and I saw tears stream down her face uncontrollably as Mom declared blessing over her. Other moments included us just staring at each other and as tears would roll down my face she would just look at me, smile and say, “Trisha, it’s okay, I’m going to be with Jesus.” She was so courageous and she anxiously welcomed her new transition with so much peace. She was at such peace that she instructed the doctors to take her off all medications and anything that provided her assistance with her health. Supernaturally, she was being sustained by the healing power of Christ. Once while my brother and I were in a meeting with the team of doctors, one spoke up and said, “We can’t understand how she is not in any pain?” Instantly another physician spoke up said, “The ONLY thing I can attribute it to is her faith”. Without hesitation my brother and I both declared that was EXACTLY the reason. Every morning we would do devotions and thank God for another day and somehow that prayer meant more to me than ever before because for the first time, I was counting the days we’d be given. There were lots of prayers, smiles, hugs and I love yous . Minutes turned to hours and hours to days and before we knew it the clock had run out and Mom stepped into her eternal home. When my sister woke me up at around 11:00 pm November 21st and said Mom’s chest was no longer moving I embraced my new reality, she was gone. My brother led us in prayer right there in her room and all we could do was thank God for the journey and that this was not a forever goodbye just a “see you later”. The doctor who confirmed her passing was one of the physicians Mom believed salvation for. His words to us were, “If anyone could make me believe in God, it was this woman.” I never saw my mom more alive than when her physical body was dying. Today, life is very different for me. There isn’t a day that goes by that I don’t think of her and shed tears. The pain is real but the grace is greater. You never get over losing someone but you do get through it. While I would not want to walk through this scenario again in the same way as with my mom, I can honestly say I’m grateful for the journey. I walked with my mom through the valley of the shadow of death and there was no fear because death was just that, a shadow. For the believer, to be absent from the body is to be present with the Lord. Death did not win and sickness did not prevail. I can testify that God is close to brokenhearted. He binds up our wounds and His strength is made perfect in our weakness. We may not understand our circumstances but we can trust that God ALWAYS has our best interest at heart. He is a GOOD, GOOD Father! My mom was just on loan to us here on earth; she belonged to Christ. While she would be the first to admit she was not perfect, she was the greatest mom I could have been given. While my heart is still hurting, I find strength and healing in knowing she imparted in me all that I need to carry out God’s assignment on my life AND one day I will be reunited with her in heaven! The greatest way for me to honor my mom is to apply the Godly wisdom she instilled in me. I can still hear her words of wisdom echo in my ear, her laugh in my thoughts and her strength in my heartbeat. Most importantly I can feel God’s presence as close to me as my next breath and His love so tangible. If you’re hurting today over the loss of a loved one, a dream or relationship…hold on to God because He’s holding onto you! So yes, while there is grief there is joy that comes in the morning AND in the mourning.